Boy, have I got a treat for you today! The name of this pizza may be a mouthful, but trust me when I say you’ll be wanting to stuff your mouth full with as much of it as possible as soon as you taste that first bite. 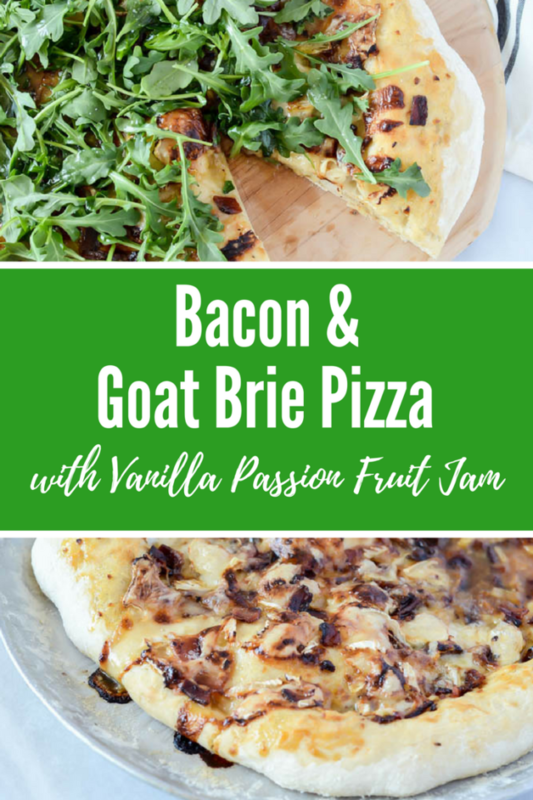 Bacon and Goat Brie Pizza with Vanilla Passion Fruit Jam, your day has come. Okay, I know I haven’t entertained you with my travel post all about our second honeymoon/babymoon to Kauai yet, but I promise it’s coming! And this recipe can be seen as a little sneak peak of what’s in store, because I actually got the idea from one of the restaurants we visited in a little town called Kapaa. We stopped into The Local one afternoon after a hike to some waterfalls and some glorious beach time, ready for a refreshing drink and light snack. We had scoped out the menu online, and the place had come highly recommended to us by a few of our friends, so we definitely wanted to check it out. 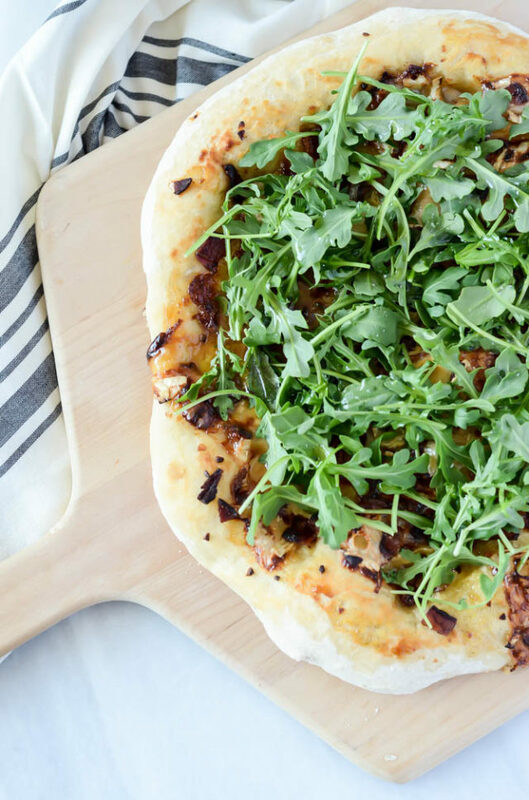 Among other things, “The Local Pizza” had caught my eye – I mean, this gal can’t really pass up a pizza that features brie, bacon, arugula and JAM – and I was instantly curious. Unfortunately, since we were there around 3:00pm, we were too late for lunch and a little too early for dinner, so we only had a limited Happy Hour menu available to us to order, which meant no pizza 🙁 That’s okay, though, we made up for it with a huge basket of French fries and tasty deviled eggs with crispy chicken skin on top. Nevertheless, I snapped a photo of the pizza’s description on the menu and decided I’d just have to make my own version to try it out! Man, I love it when I’m not disappointed. 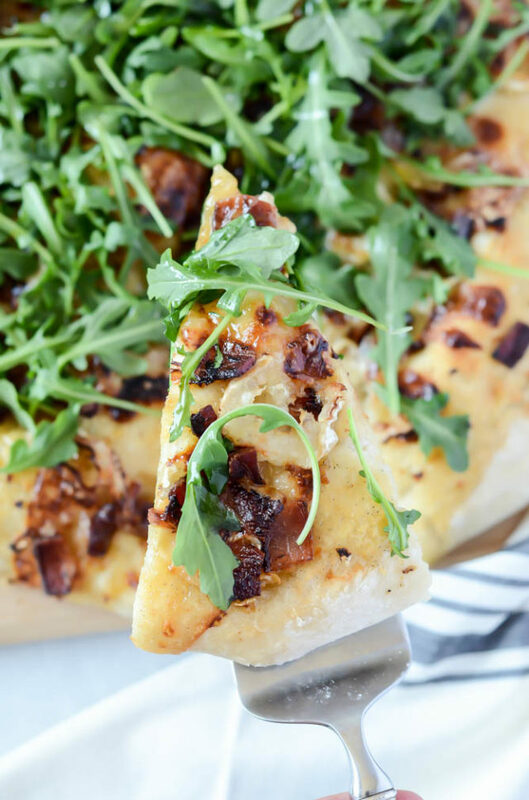 The original recipe for The Local Pizza included local papaya vanilla jam, brie, bacon, arugula and the option of adding sliced jalapeños on top. I knew it would be a little tricky for me to find papaya vanilla jam at home, so I raided the pantry to see what sort of tropical fruit jam we had and came across passion fruit (or lilikoi) that we had found at our local Asian market. Another flavor that is a little more easy to come by here in the states is guava jam, which would also be a fantastic option. The issue of adding in some vanilla flavor was easily solved by stirring some vanilla bean seeds into the jam when I was ready to spread it on the pizza. The only other changes I made to the original toppings were (a) omitting the jalapeños (I’m not a huge fan unless they’re involved in some sort of Mexican food) and (b) using goat milk brie instead of the more typical cow milk brie. As I do with just about all my pizzas these days, I turned to Jim Lahey’s internet-famous pizza dough recipe for my base to this tasty treat. Even though it requires an overnight rise, it is soooo easy and takes less than 10 minutes to prep. You could also use some store-bought pizza dough if you’re feeling lazy (my fave is Trader Joe’s brand) but trust me when I say Jim Lahey’s dough is totally worth the slightly more trouble (if you call mixing a quick dough together harder than getting in your car and driving down to your local supermarket, looking for parking, standing in line, etc.) Bacon and Goat Brie Pizza with Vanilla Passion Fruit Jam is just a leeeetle special, so I think it’s fair to say it deserves a special crust. Jim Lahey’s recipe asks you to break the dough up into four pieces for four smaller pizzas, but I used the entire recipe to make one big pie. This made the crust slightly thicker, so if you’re more a fan of the thin-crust stuff, you may want to break it down to two (or even the four suggested) pies. 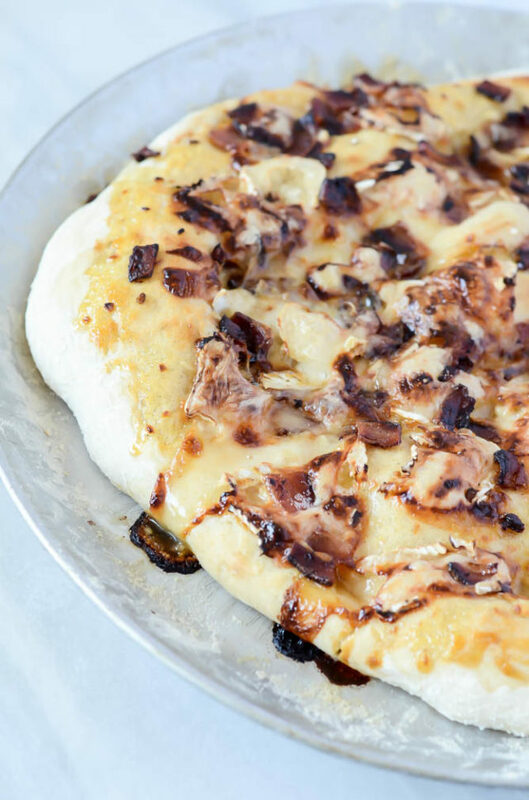 Because there are so many delicate flavors on this pizza, I of course omitted any sort of tomato or white sauce and stuck to a simple coating of olive oil and fresh garlic before loading on the vanilla-scented jam, bacon and goat brie. 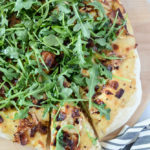 After a quick 15-minute turn in the oven, your Bacon and Goat Brie Pizza with Vanilla Passion Fruit Jam is ready for its “crowning moment”: a hefty sprinkling of fresh arugula, dash of olive oil and sprinkle of sea salt! After taking your first bite, you’ll definitely notice the flavor explosion – sweetness from the jam, saltiness from the bacon, an earthy creaminess from the goat brie and a fresh bite from the arugula. So many wonderful things going on! You may also just feel like this Bacon and Goat Brie Pizza with Vanilla Passion Fruit Jam is transporting you to a tropical island somewhere, which isn’t a bad way to spend a Monday, am I right?? 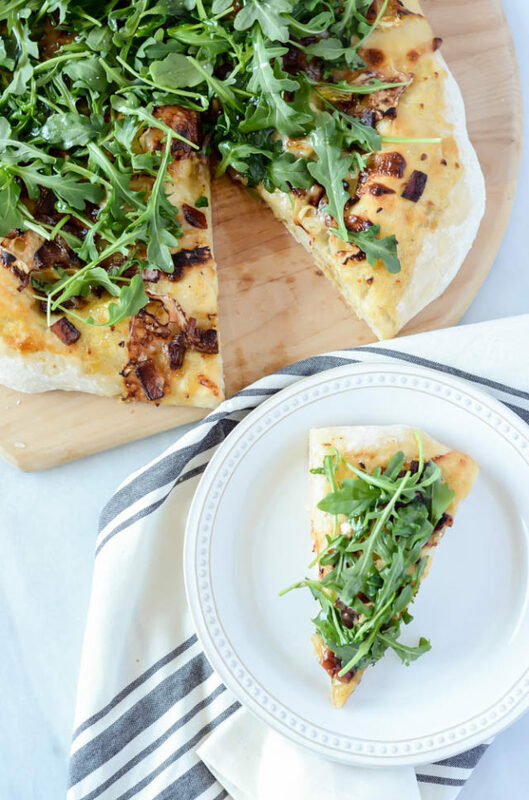 This pizza is a flavor explosion - sweetness from the jam, saltiness from the bacon, earthiness from the goat cheese and the fresh tang of arugula! In a large, greased pizza pan, roll out the pizza dough to the desired thickness and shape. Spread on the olive oil using a pastry brush or paper towel, then sprinkle on the minced garlic. In a small bowl, combine the jam and vanilla bean seeds. Spread the jam mixture evenly onto the pizza crust over the olive oil and garlic. Sprinkle the goat brie and bacon pieces over the jam, then place pizza in the 475 degree oven for 10-15 minutes, depending on the thickness of your crust. Remove when crust is slightly golden and feels firm to the touch. 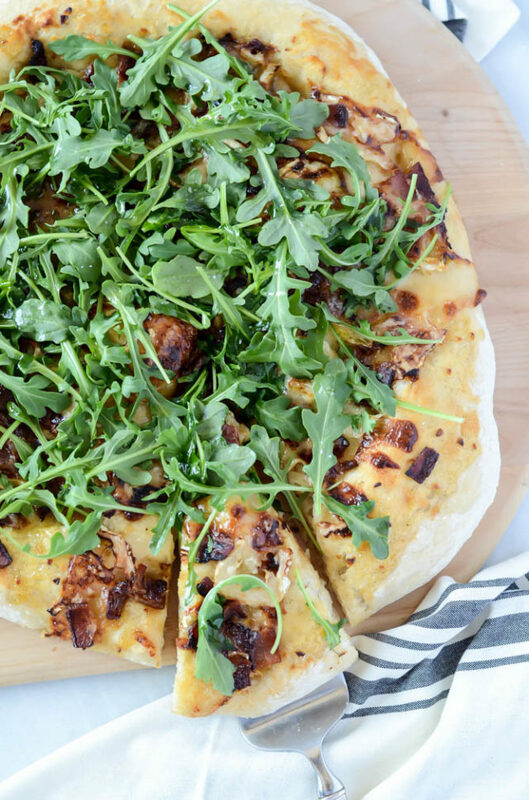 Sprinkle arugula over the cooling pizza, then drizzle with olive oil and sprinkle on some sea salt. Serve immediately. I sure hope you’re ready for more MEAT! This post was created in partnership with True Aussie Beef & Lamb and Big Green Egg in exchange for free product. As always, all thoughts and opinions are my own. Thank you for continuing to support the brands that make CaliGirl Cooking possible! 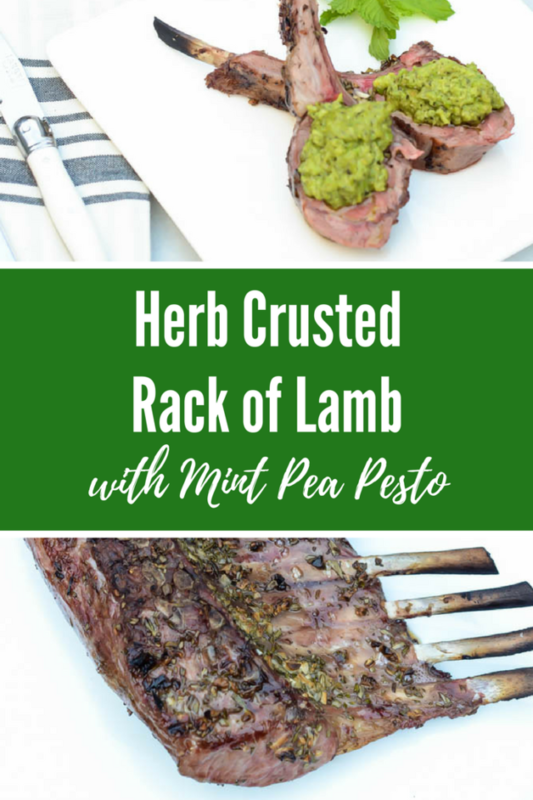 Because this Herb Crusted Rack of Lamb with Mint Pea Pesto is one for the books and I need you to make it ASAP. First, important question: How do you feel about lamb? Do you love it? Hate it? Haven’t tried it? I never knew until recently how uncommon lamb as a meat option is in the greater United States. I mean, I grew up in California, with a fairly progressive upbringing food-wise, but I was recently pretty surprised when I was at a luncheon (not in California) that served lamb as the main dish and soooo many people at my table had either never tried it or just not grown up eating it. Man, have they all been missing out! I was already a big fan of lamb before my partnership with True Aussie Beef & Lamb, but I have to say I became even more so (and converted a few non-lamb eaters) after I tasted the product I was sent. Seriously, guys, #TrueAussieLamb is LEGIT and I’ve made the most delicious Herb Crusted Rack of Lamb with Mint Pea Pesto to showcase it. But really, I kept waiting for one of the meats that True Aussie Beef & Lamb sent me to be #average, and I’m happy to report that was most definitely never the case. Every time we bit into a new recipe I created featuring their beef or lamb, we were groaning with delight about how tender and decadently flavorful the meat was. If you haven’t tried their stuff yet, you’re definitely missing out. Okay, and the Big Green Egg. I’m giving that a much deserved shout-out as well because it is so. much. fun. To be honest, I know the basics of grilling, but the hubs takes care of most of the outdoor cooking in our household. When our Big Green Egg was delivered, I was determined to learn how to use it so I could take all the credit for these tasty dishes I was creating. I’m happy to say that, aside from pouring the charcoal in and lighting the fire (because, yo, preggo lady over here) I was able to learn exactly what needed to let these cuts of meat shine in all their glory. So let’s get into it and talk about this Herb Crusted Rack of Lamb with Mint Pea Pesto, shall we? As I mentioned before, I was raised eating a fair amount of lamb, and it’s one of my favorite meats to cook. I’d put it in the red meat category, but it tends to have a much more grassy, herbal flavor than your AVERAGE beef (important to note that, because #TrueAussieBeef is definitely not average.) Because of this, you really don’t need to do much to it when cooking, however there are a few ingredients that pair fabulously with it. Can you guess what those might be? You got it! Fresh herbs (especially rosemary,) mint and peas!! 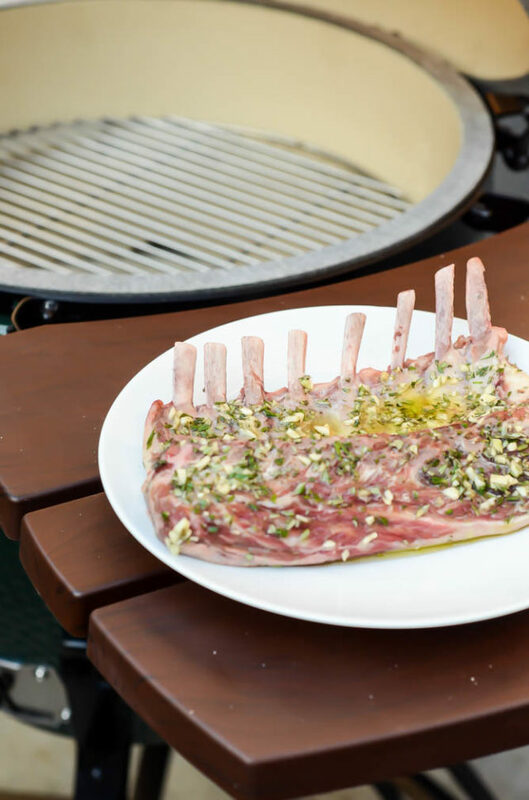 We start out by massaging our rack of lamb with a simple yet tasty blend of fresh garlic, rosemary, salt, pepper and a bit of olive oil to make it all stick. Throw that beautiful piece of herb crusted lamb on your Big Green Egg (yes, one could be yours, see below!) and give it a nice sear. It doesn’t take much, our rack of lamb is delicate and tastes so much better when there is still a little bit of pink in the center of the meat. 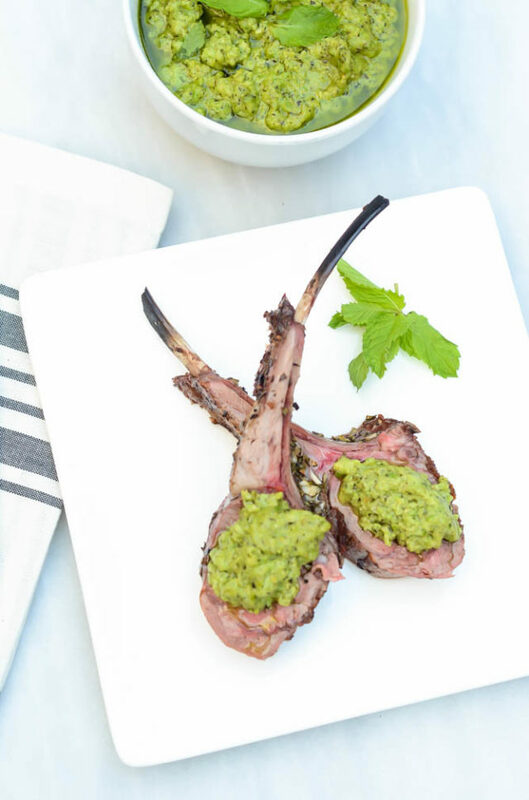 Meanwhile (or even before you get to cooking the lamb,) you’ll want to whip up the creamy, fresh Mint Pea Pesto that will grace the top of each “lamb pop” you serve. It’s a fairly typical pesto, but with equal parts fresh mint and peas as the base rather than basil. This gives the lamb a truly Mediterranean feel, and adds a beautiful pop of bright green color to the plate. 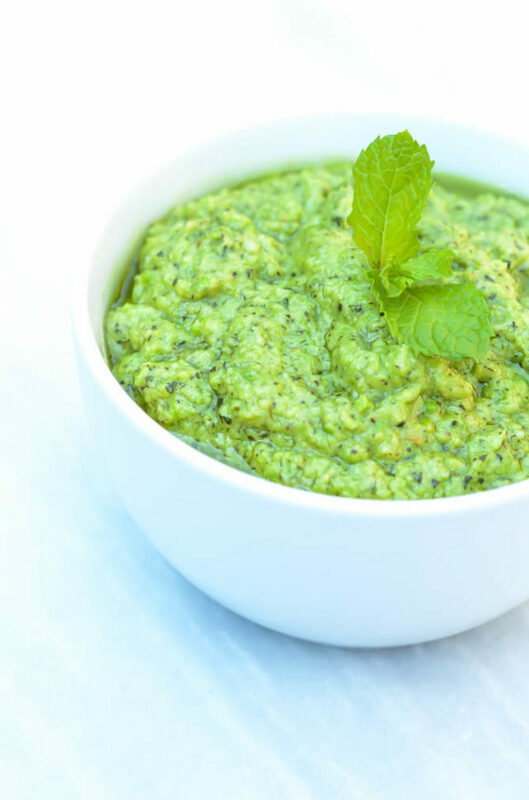 It’s also important to note that you’ll likely have some leftover pesto after the lamb is served, so be sure to have some crusty bread on hand for dipping or save it for a last-minute pasta dinner later in the week. That’s it for the recipe, now let me tell you about this giveaway. 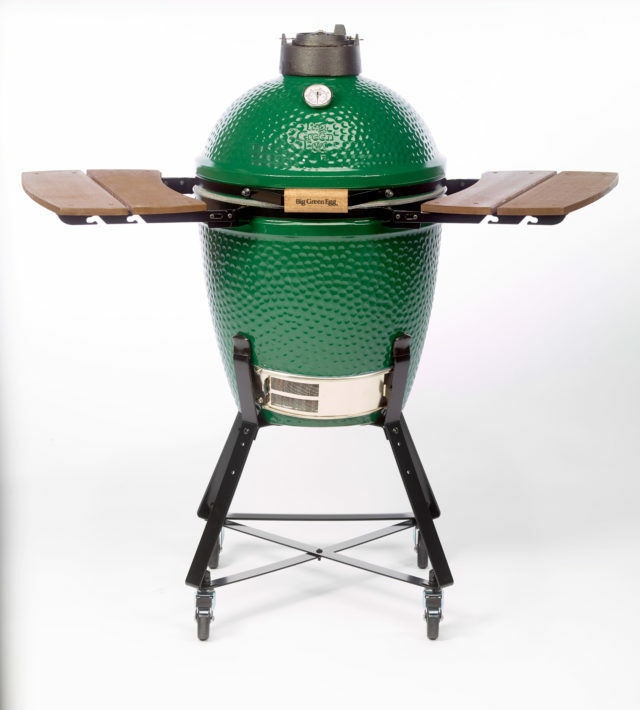 If you didn’t catch it in last week’s post, True Aussie Beef & Lamb and Big Green Egg are hosting a “Greater Outdoors” promotion where they are gifting one lucky reader their very own Big Green Egg! Seriously, you don’t want to miss out on this opportunity. The Egg is amazzzzing!! Simply click here to enter before the giveaway ends on August 1. 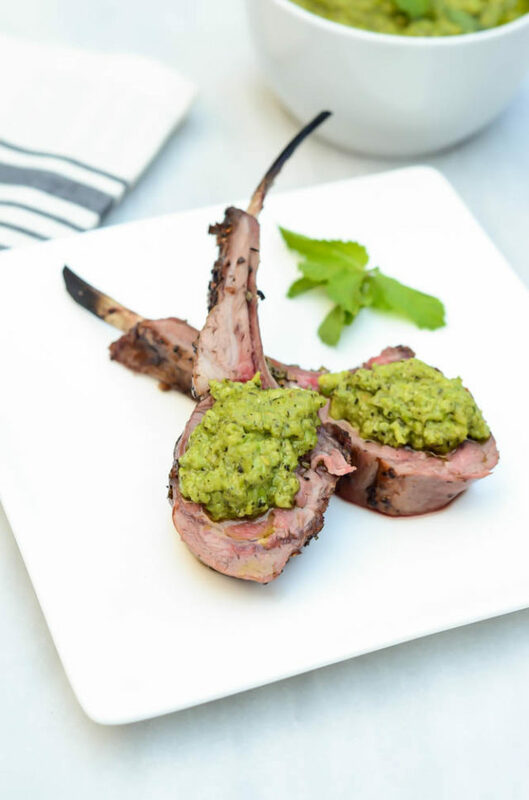 A beautiful piece of lamb is coated with a fresh rosemary-garlic mixture and topped with a delicious mint pea pesto. Heat your grill to high heat. If using the Big Green Egg, you’ll want it to read a temperature of 500 degrees Fahrenheit. Next, prepare the herb rub for the rack of lamb. Combine garlic, rosemary, salt, pepper and olive oil in a small bowl, then rub onto both sides of the lamb rack. 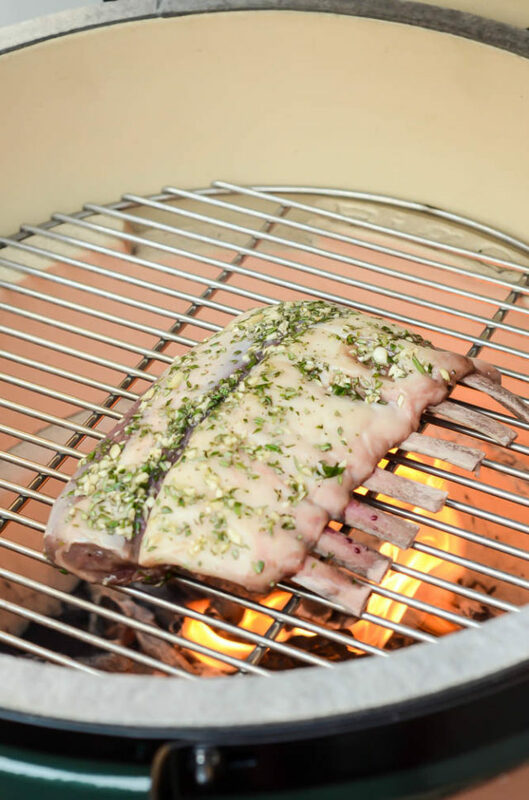 Once the grill or Big Green Egg is heated properly, add the lamb and cook for 7-8 minutes each side, or until internal temperature reaches between 120 and 125 degrees Fahrenheit (for medium-rare.) Remove the lamb and let rest in a warm place for about 10 minutes before cutting and serving. 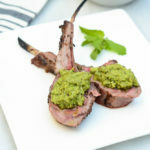 You can make the Mint Pea Pesto prior to grilling the lamb or while the lamb is resting. Combine all pesto ingredients except the olive oil, salt and pepper in a food processor. Pulse until all ingredients come together to form a rough spread, then slowly stream in the olive oil. Finally, add salt and pepper to taste. 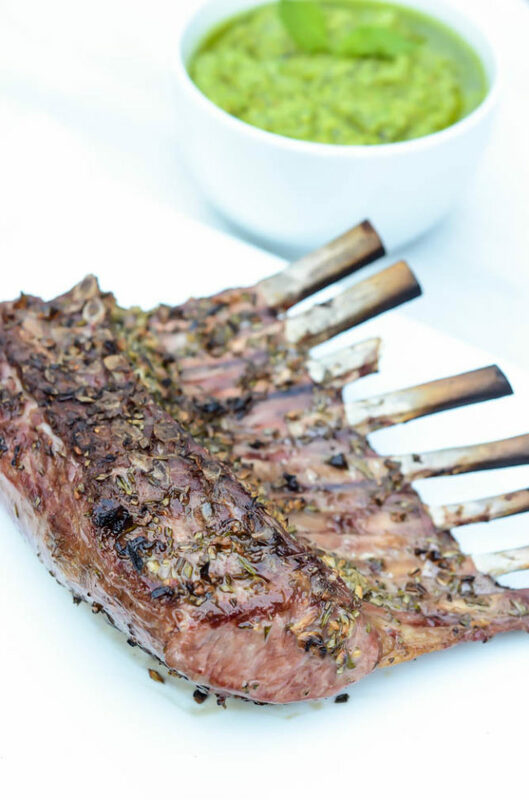 Once lamb has rested and pesto is prepared, cut the lamb into chops and top each top with a heavy dollop of pesto. Reserve extra pesto for crusty bread or save for a future quick and easy pasta dinner! Today’s post comes with allll the mixed emotions. 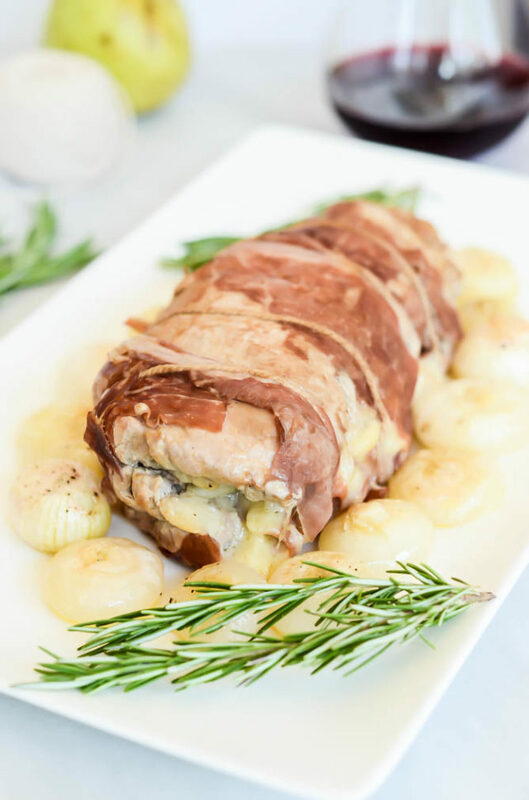 There are happy memories, there are sad moments, all of which I will get more into in a moment but, for now, let’s just look at this Pear and Gruyere Stuffed Pork Tenderloin with Roasted Cippolini Onions as a nostalgic meal best shared with those you love. Because life is all too fleeting, and you need to grasp those moments when you have them. 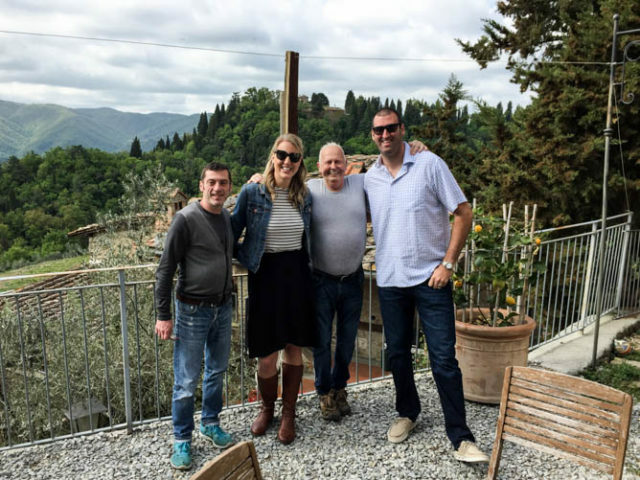 If you read my Travel Diaries: Tuscany post, you already know that this past April the hubs and I went with both of our parents and my aunt to visit our dear friends Sergio and Stefano at their beautiful Tuscan villa. My aunt and I had been there before, but our parents had yet to experience their over-the-top hospitality and beautiful grounds. 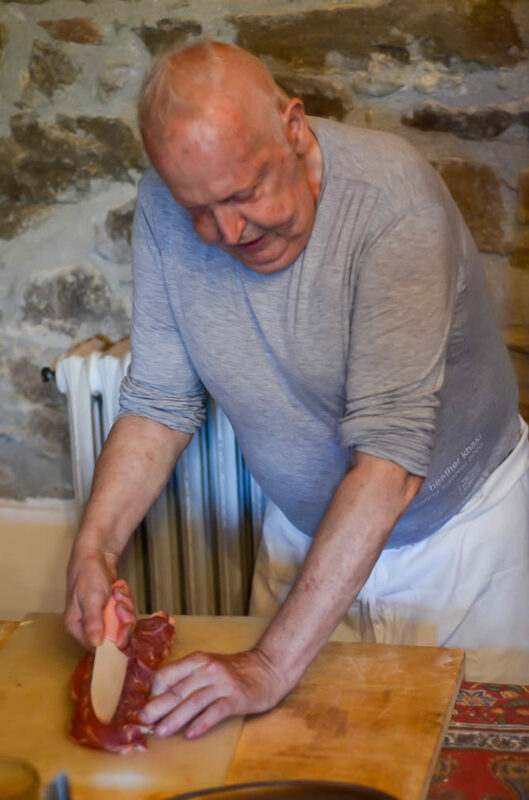 One of the biggest regrets I had on that first trip with my aunt was that we spent every day out and about exploring, and never had the chance to stay at the Villa for a day and take a cooking class, which Sergio and Stefano specialized in. I knew that when we went back to visit this was going to be a MUST. Who doesn’t want to learn what goes into true Italian cooking? So we spent one day on our last trip in the kitchen, learning all about how to make the fluffiest homemade gnocchi, the beefiest Bolognese and the richest tiramisu. I seriously don’t know how we did it all in the course of half of a day. But Sergio and Stefano had it down to a science, and boy did they make it all look so easy. They’d been teaching classes together for years, even traveling to the U.S. to do so, and it was oh-so-apparent in the way they took us through all of the recipes like a well-oiled machine. We got some sad news a couple of weeks ago. Unfortunately, Sergio had lost a long struggle he had been fighting over some health issues the last couple of years. As would be expected, we were all deeply saddened by the news. At the same time, I feel so grateful that we were able to make the trip and spend so much time with him when we did. Sergio was such a gem: humble, kind, selfless and one of the friendliest people you’ll ever meet. He and Stefano had taken our crew by the hand during our trip, being the most selfless hosts while also escorting us on all of our excursions, serving as our own personal tour guides. They truly made us feel like family. As I often do when struggling with difficult emotions, I decided the best way to both express my sympathy and honor Sergio’s memory would be through cooking. 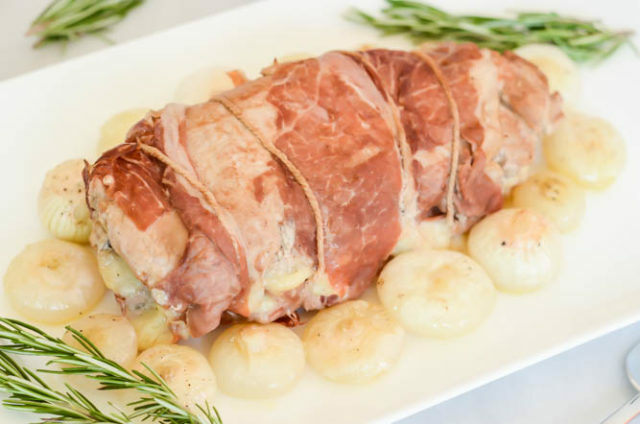 This Pear and Gruyere Stuffed Pork Tenderloin with Roasted Cippolini Onions is my own personal take on one of the (many) recipes we learned to make during their cooking class and, I have to say, I think Sergio would be proud. It’s actually a lot more simple than it looks (or sounds,) yet is an elegant dish to serve a dinner table full of guests you care about. The version we made at the villa was filled with apples and Parmigiano, but for this version I decided to sub in one of my favorite combos: fresh pears and gruyere. 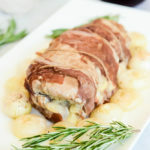 The pork tenderloin is already beautifully decadent with the filling, but becomes even more so with the light jacket of prosciutto that’s wrapped around it just before cooking. It’s cooked completely on the stove top, but with very little hands-on work. A quick flip of the tenderloin about halfway through cooking is all you’ll need. 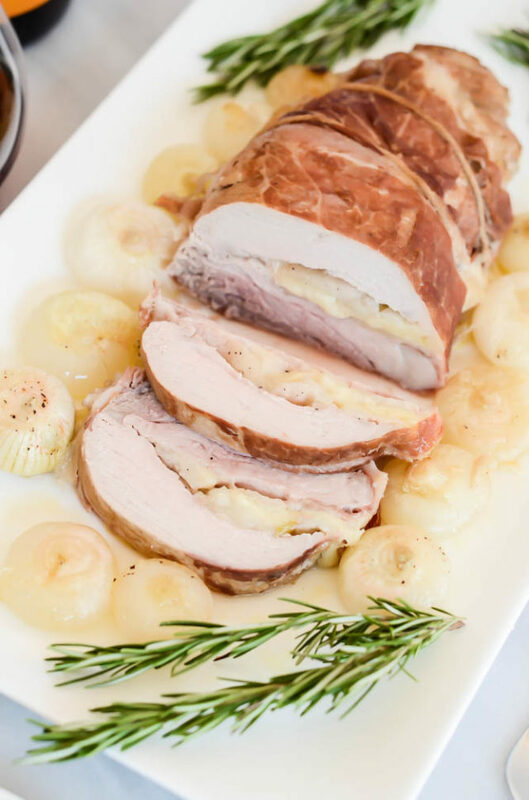 We leave the oven open for roasting the cippolini onions, which are the perfect contrast to the Stuffed Pork Tenderloin with their sweet yet tangy glaze. So here’s to all those we’ve loved and lost too soon, and all of the recipes we have to share the memories. Cheers to you Sergio, che tu possa riposare in pace. 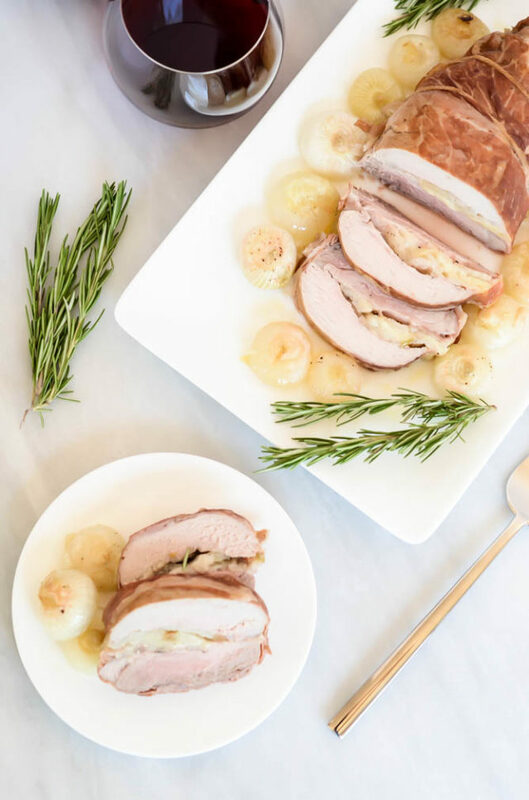 Pork tenderloin makes the perfect dinner centerpiece when stuffed with pears and Gruyere and wrapped in crispy prosciutto. Begin by pounding the pork tenderloin to a ½-inch thickness. Sprinkle with salt and pepper, then layer on the pear and Gruyere. Lay out the slices of prosciutto on a piece of plastic wrap so that they mimic the shape that the tenderloin has taken. For mine, I made two columns of three slices of prosciutto each, right up next to each other. Place the pork on top of the prosciutto. 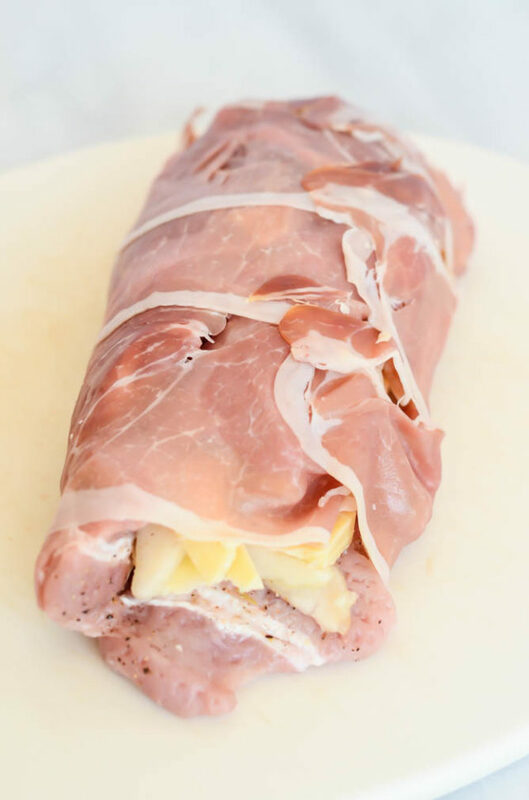 Using the plastic wrap to hold everything together, first roll up one side of the tenderloin, then the other, having the two ends of the pork meet at the top, with the prosciutto extending over that seam just a bit. Using a piece of butcher’s twine, make loops down the length of the tenderloin to hold everything together. I just kind of made up my method, but use whatever works best for you while losing as little of the filling as possible. Preheat the oven to 350 degrees Fahrenheit for the onions. Once the pork is browned, pour in the sherry and let the alcohol evaporate off a bit, about 3 minutes. Add the chicken broth. Cover the pot or pan and cook for about 15 minutes. While the meat is cooking, prep the onions. In an 8-by-8-inch baking dish, spread out the onions in a thin layer. Cut the butter into tablespoons and drop the tablespoons evenly over the onions, followed by the sugar, white vinegar, salt and pepper. Place in the preheated 350 degree oven and cook for 30-40 minutes, or until the onions are golden brown and can be pierced easily with a fork. After 15 minutes, remove the lid and pour off the liquid until only about ½ cup remains. Flip the pork over and replace the lid. Cook the pork for another 15 minutes, or until cooked through. 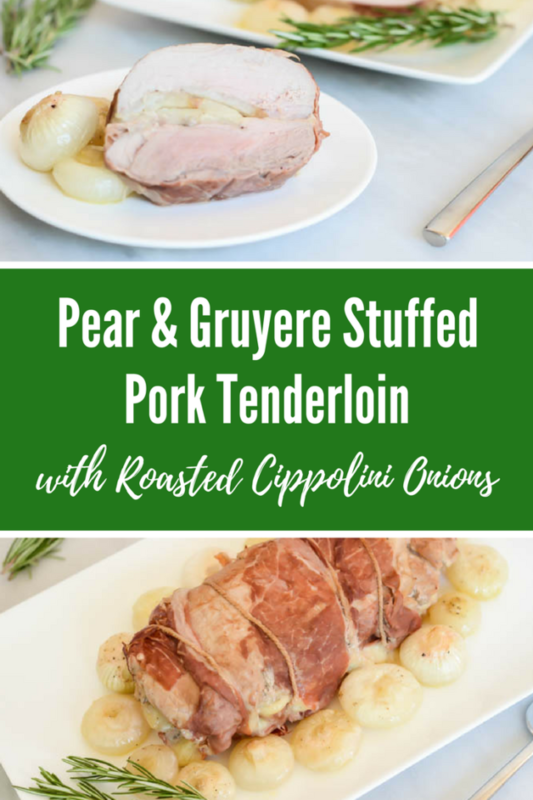 Transfer the pork to a serving dish and surround it with the cooked cippolini onions. Garnish with whatever fresh herbs you may have on hand! It’s summer time and the cooking is easy! This post is sponsored by Frontier Co-Op. At least that’s what we like to think, right? Memorial Day is behind us, which means we’re heading full-throttle into warm weather eats. And what better way to #SpiceUpSummer than with top-quality herbs and spices? 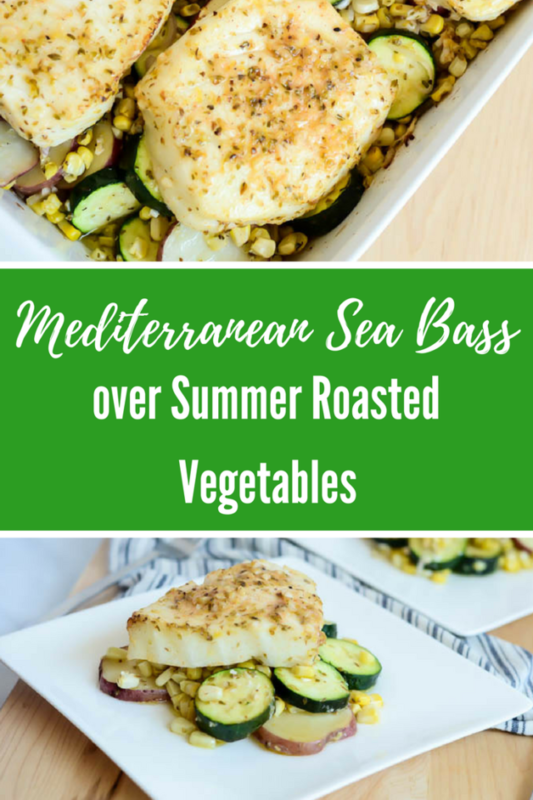 Today I’m partnering with Frontier Co-Op to bring you this incredibly fresh and delicious Mediterranean Sea Bass over Summer Roasted Vegetables, which I can guarantee is going to become one of your go-to meals over the next few months. 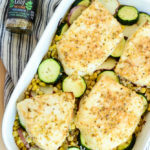 It’s loaded with the best in-season flavor – Frontier’s own Oregano Leaf, tons of lemon juice and a touch of cayenne pepper – and since it uses just one dish, it’s incredibly easy to whip up on any night of the week with minimal cleanup. If you ask me, there’s no better way to #CookWithPurpose, one of Frontier’s main initiatives this summer. I love working with Frontier Co-Op because of this very message. To them, it’s all about working together to create sustainable, high-quality products that bring people together through delicious food. And you know I’m all about that! Herbs and spices are some of the best tools we can use to accomplish this. They add so much incredible flavor to a recipe for very few calories, which makes healthy, delicious cooking easier than ever. They’re also perfect for those hot summer days when you want to pull together a wholesome, nutritious meal with minimal time spent slaving away over the stove or in the kitchen. 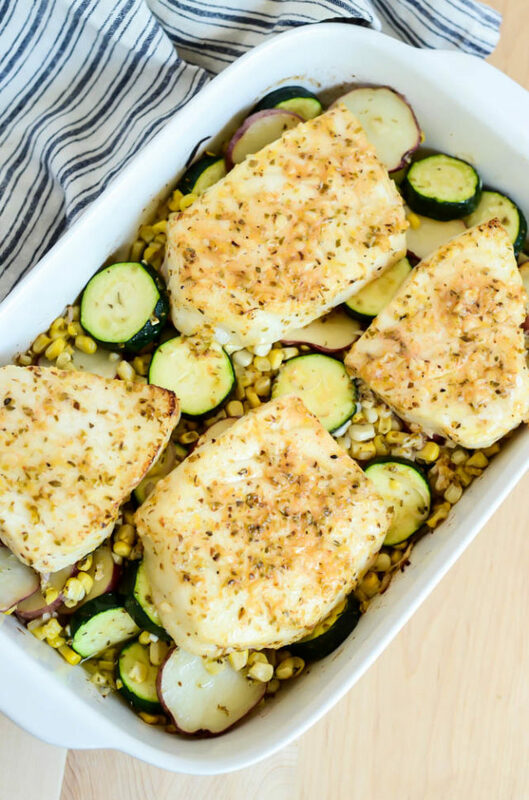 This Mediterranean Sea Bass over Summer Roasted Vegetables most definitely falls into the quick-to-make/easy-to-cleanup/loads-of-flavor category. All it takes is a half-hour marinade for the fish, 20 minutes in the oven, and a tableful of hungry people. I opted for sea bass for this particular recipe because it looked the best at the store, but you can really use any firm white fish. Just make sure all of your filets are about the same thickness so they cook evenly in the oven. The sea bass (or whichever fish you opt to use) gets marinated in a tasty blend of Frontier Co-Op Oregano Leaf, fresh garlic, lemon juice and olive oil. This imparts all of those delicious flavors throughout the filets, so you get all of the deliciousness in every single bite. Plus, since we’re working with fairly delicate fish, it only needs a half-hour marinade. Because when we’re trying to #CookWithPurpose, we don’t want to waste away an entire evening waiting for our dinner to be ready! Once you have the sea bass part of your Mediterranean Sea Bass over Summer Roasted Vegetables ready to go, prepping the vegetables is easy. Feel free to use your creative license here, but I opted for zucchini, red baby potatoes and fresh corn. Oh, and shallots, because shallots make everything better. The “do” for these is even easier than the marinade for the fish. We’re bathing our veggies in a simple dressing of olive oil, more oregano, salt and pepper. It really doesn’t take much when we have all of those amazing flavors going on with our fish. We give the vegetables a little head start in the oven to make sure they have time to cook all the way through, then we add the sea bass for the last 12-15 minutes. It won’t take long for all of the delicious smells from the Oregano Leaf and lemon juice to start wafting through the house, so it’s a good thing you won’t have to wait too long before enjoying! What are your favorite warm weather recipes featuring herbs and spices? How are you going to #SpiceUpSummer this year? 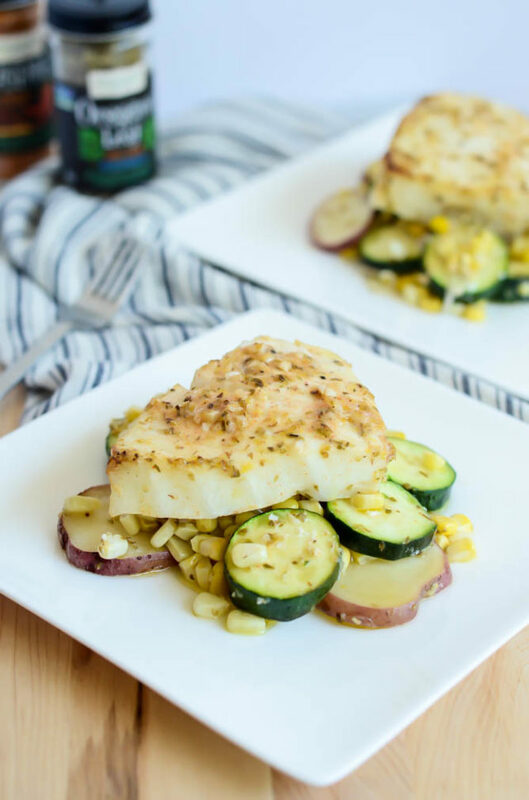 The perfect, healthy, one-dish meal featuring fresh sea bass and summer's best produce, with tons of zesty Mediterranean flavor. 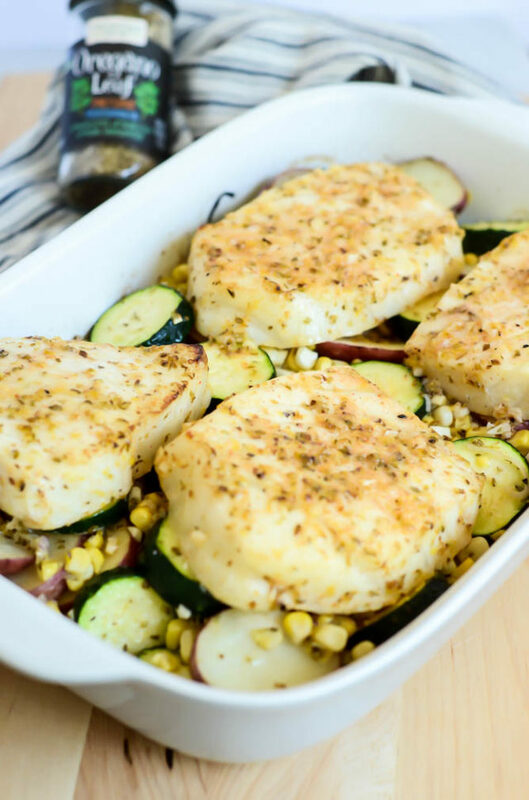 Combine sea bass and all other marinade ingredients in a large, resealable plastic bag, making sure the marinade covers the fish fairly evenly. Place bag in refrigerator to marinate for about 30 minutes. Next, prep the vegetables. Toss all vegetable ingredients together in a large casserole dish. Once oven is preheated, place vegetables in for 5-10 minutes. Remove vegetables from oven (do not turn off oven) and place the marinated sea bass filets over top. Return casserole dish to the oven and bake for another 12-15 minutes, or until the sea bass is cooked through. Serve immediately. 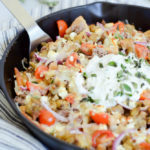 I guess you could actually call these absolutely to-die-for Greek Nachos a Greek-Mexican hybrid recipe though, since we’re taking one of my favorite Mexican food dishes and giving it a Mediterranean twist. 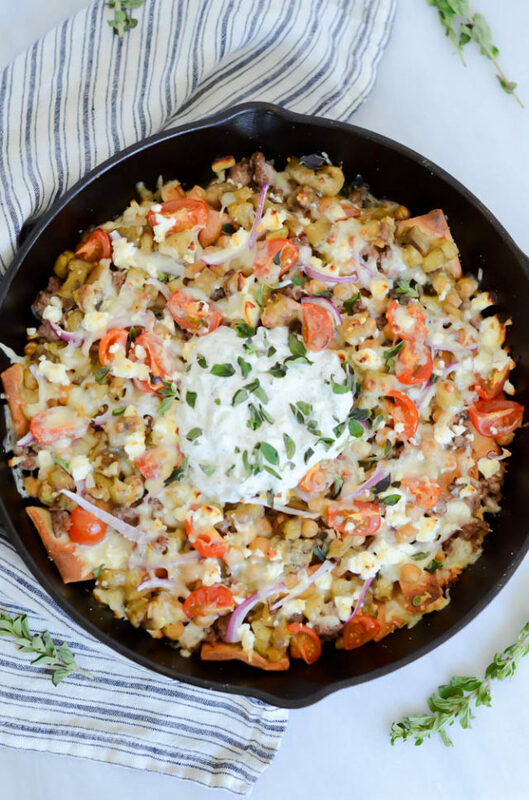 I’m really not sure why the Greek Nacho path hasn’t been traveled down more often, because when you basically sub in Greek-inspired ingredients for your typical nacho fixin’s, the result is show stopping. You may never want to eat regular nachos ever again. Aside from these nachos, I don’t have too much other stuff to share with you today. More due to the fact that I’m a bit jetlagged (read: brain dead) from our trip and we’re driving back to Santa Barbara from the Bay Area today. Tomorrow, back to reality but at least we only have a few more days until the weekend! I fully intend on writing at least one (if not multiple) Travel Diary posts about my trip once I’ve had time to recover and soak it all in, so stay tuned! In the meantime, let me tell you a little bit about these Greek Nachos. Because, yes, you want to know allllll about them. We start in the most obvious of places: with the chips! 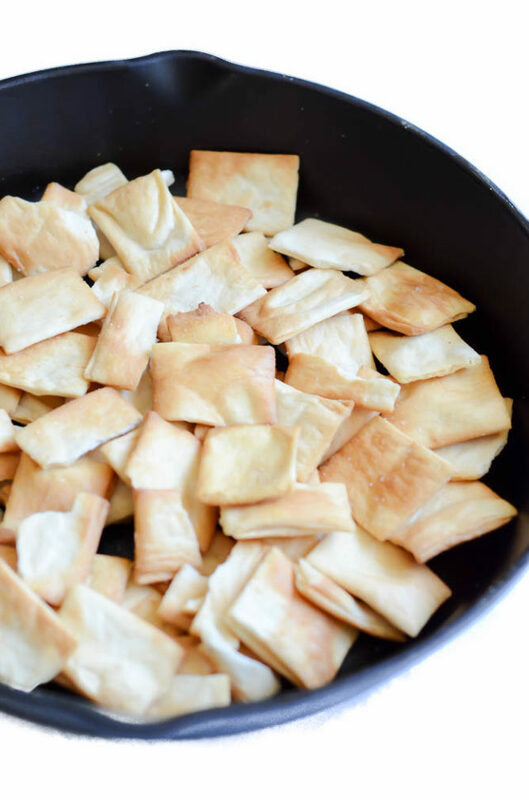 We’re kicking off the Greek theme by replacing the typical tortilla chips with crispy plain pita chips, which in fact almost work better than tortilla because they tend to be thicker and sturdier – which means they can easily hold up to all of the tasty toppings we’re going to add! The first matter of business in getting together said toppings is whipping up some healthy and tangy tzatziki sauce. I used a base of nonfat plain Greek yogurt and added lots of garlic, dill and cucumber. Make this the day before if you want, the flavors just get better as they sit. To prep the actual nacho dish, you’re going to want to bring out your best cast iron skillet. Load up the bottom of the skillet with the pita chips, then pile on all of the prepared toppings that can stand up to a little more heat. We’re talking the lamb, beans, onions, tomatoes, and of course, cheese! 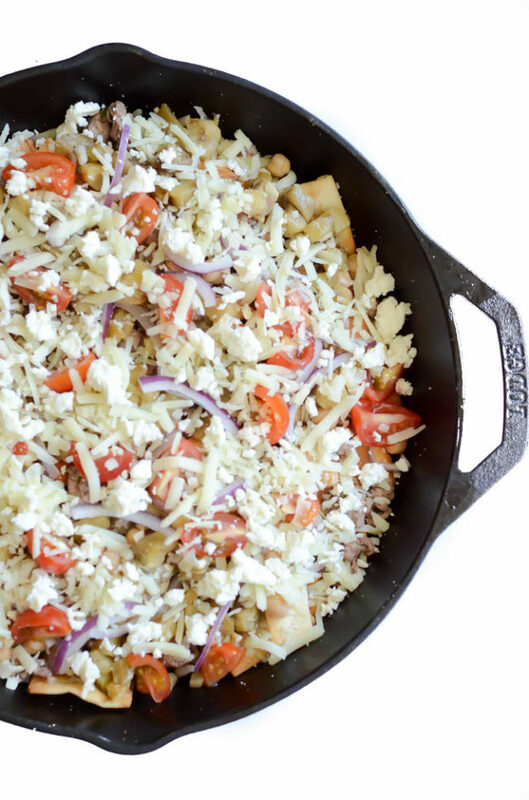 Pop all of that into the oven for about 15 minutes, top with the rest of the ingredients (like more fresh oregano and the tzatziki) and your Greek Nachos will be on the table in no time! Now how’s that for an easy Wednesday night dinner? All of your favorite Mediterranean ingredients are piled high atop crispy pita chips. 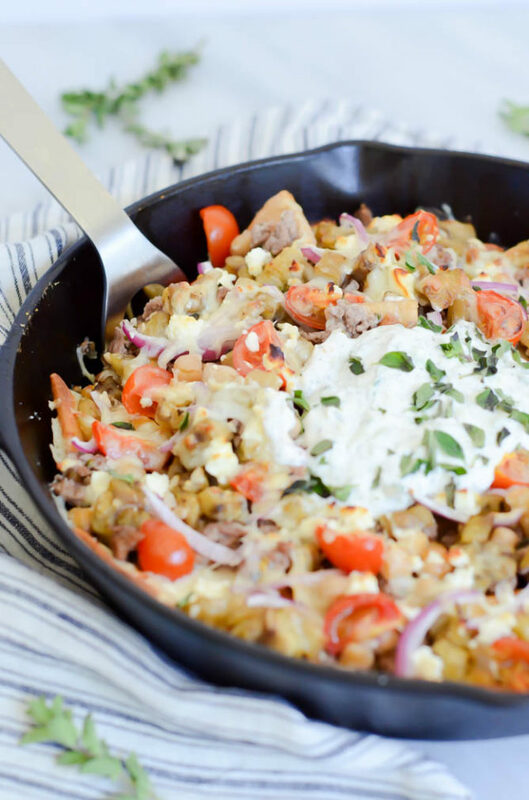 The perfect quick and easy dinner for any night of the week! First, make the tzatziki. Combine all ingredients in a small mixing bowl and stir until well-incorporated. If you have time, cover and chill the mixture for at least 30 minutes, or up to overnight. To make the eggplant, heat the olive oil in a medium saute pan over medium-high heat. Add eggplant and garlic and stir to combine. Cook until eggplant is tender, adding more olive oil as needed, then season with salt, pepper and lemon juice. Remove from pan and set aside. To make the lamb, heat another 2 tablespoons of olive oil over medium-high heat (using the same saute pan.) Add the lamb, garlic and fresh oregano and cook until lamb is browned. Season with salt, pepper and lemon juice. Turn off heat and set aside. Preheat the oven to 350 degrees Fahrenheit. Spread the pita chips evenly over the bottom of a medium cast iron skillet. 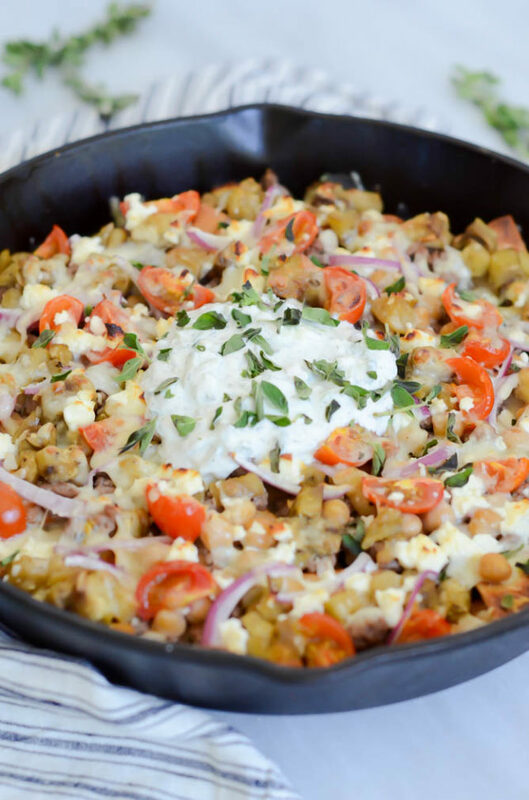 Sprinkle the eggplant, lamb, garbanzo beans, cheese, cherry tomatoes and red onion evenly over the top. Place in the oven for approximately 12 minutes, and then turn the broiler on high for an additional 3-5 minutes, or until the cheese on top is starting to brown. Remove the cast iron skillet from the oven, being careful to use potholders, and drizzle on tzatziki (you don’t have to use it all, just use however much you want.) 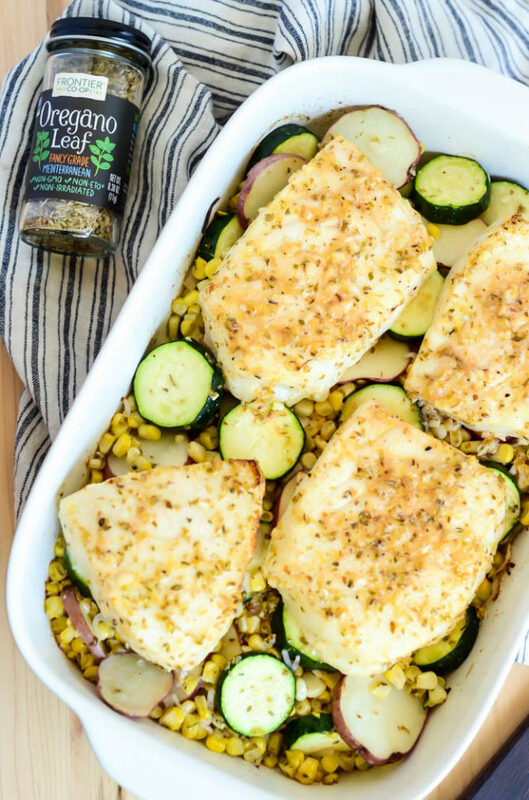 Sprinkle with more fresh oregano before serving straight out of the pan!